I love angel food cake. I never make it because it involves whipping up egg whites and all that jazz. And well, to be honest, I don’t make cake that much, so I never really get the chance to eat it. But, back in high school I used to be obsessed with store bought angel food cake. I know, I know, they kind of taste like overly sweet styrofoam, but hey, to my unsophisticated teenage palette, they were squishy wondrous slices of deliciousness. Every so often, my mom would buy one. You know the ones, in the black plastic bottom and handy-dandy plastic lid? I’d cut out a slice, wrap it up in plastic wrap and take it to school in my backpack. When I found out that Mike liked angel food cake too (yes, we were kind of sort of high school, not sweethearts, but something) I left him a generous slice with a lil note in his locker. It happened more than once and in my memory, it was one of those cute high school things you do for someone you’re sweet on. But, apparently Mike doesn’t remember this at all, because while we were on a crowded escalator, in the middle of Tokyo rush hour, we had a very quiet conversation about it. Me (almost whispering): Remember how I used to leave you slices of angel food cake in your locker? Me (slightly too loud for Tokyo, even during rush hour): WHAT? Me: You don’t remember? It was so cute! Mike: Well how many slices was it? Me: At least two, twice in a row? Jeez, how many slices would it have took to get you to remember? Mike: At least a whole cake? Me: It was so cute! Do you really not remember? I’m pretty sure Mike still doesn’t remember. If I got cake in my locker in high school…well, let’s just say it would have been a high point. Anyway, Mike’s faulty memory aside, we both like angel food cake still. 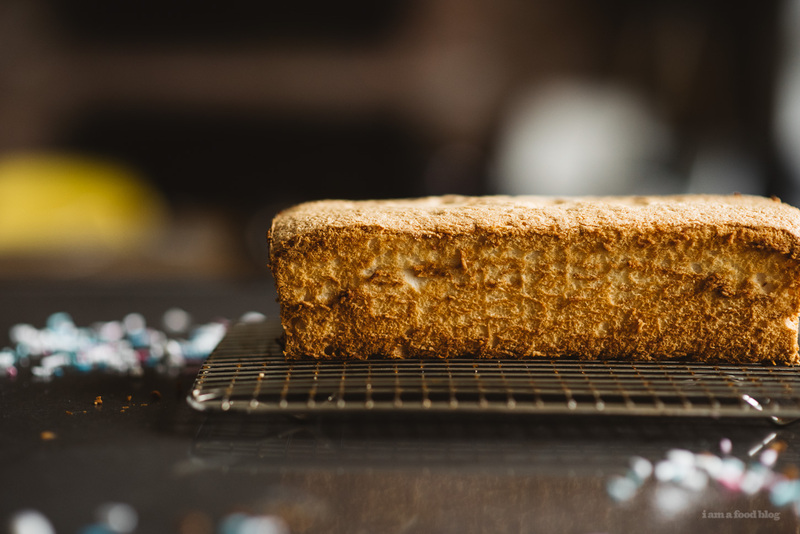 Recently I made an angel food cake loaf because cake toast! 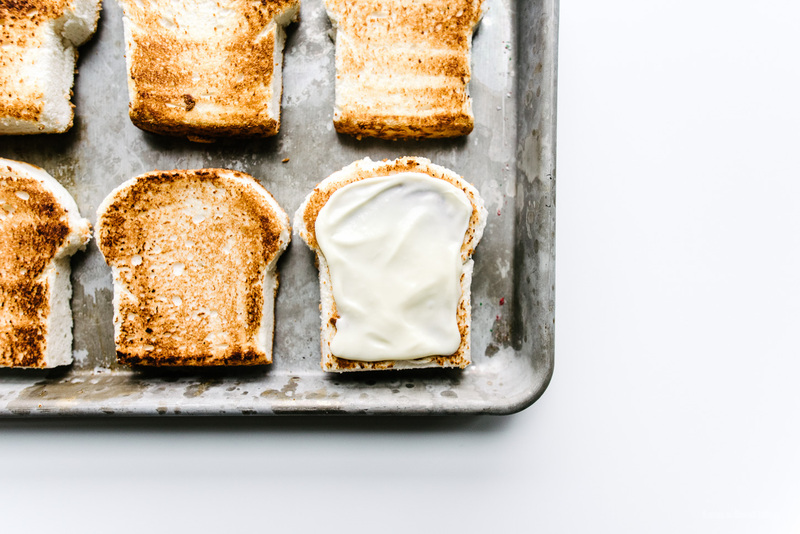 Cake toast is, simply, toasted cake! It’s delicious because the edges get hot and crispy and the insides stay, well, cake-y. My angel food cake didn’t rise over and make that classic bread shape and instead of getting down about it, I just cut it so that it looked like bread. 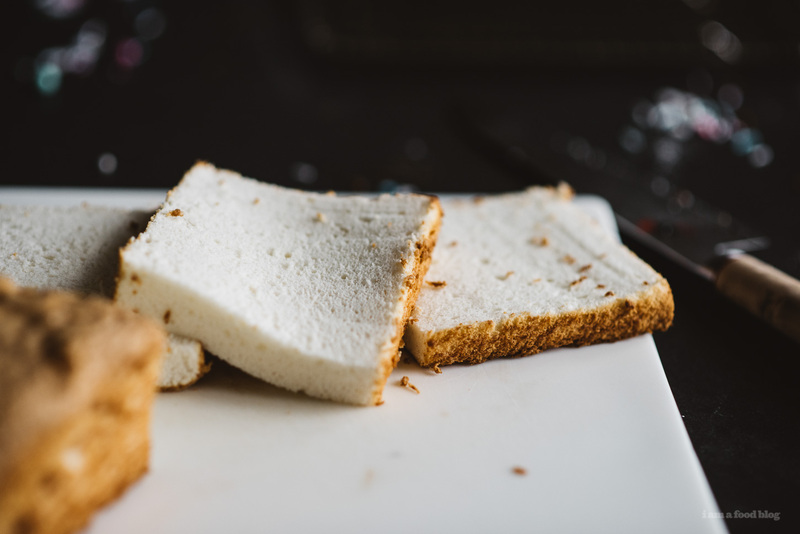 To be honest, I’m pretty sure angel food cake can’t dome the way bread does – usually it just kind of levels off, so I guess I was setting myself up for failure. But, it ended up being a good thing because these little slices are so cute. PS – If you want to follow along on our Tokyo adventure, you can check out daily iPhone photo dump on our Flickr stream. I’m not the best at updating, but I do get around to it, eventually. Also, I just got into Flickr and I absolutely LOVE it – you can upload multiple photos at once, which is perfect for me. I would do the whole insta thing but I take way too many photos and I find that people on insta are kinda sort of weird when you post too much. So, Flickr for the win! Only check if you wanna see lots of random photos, not just of food. 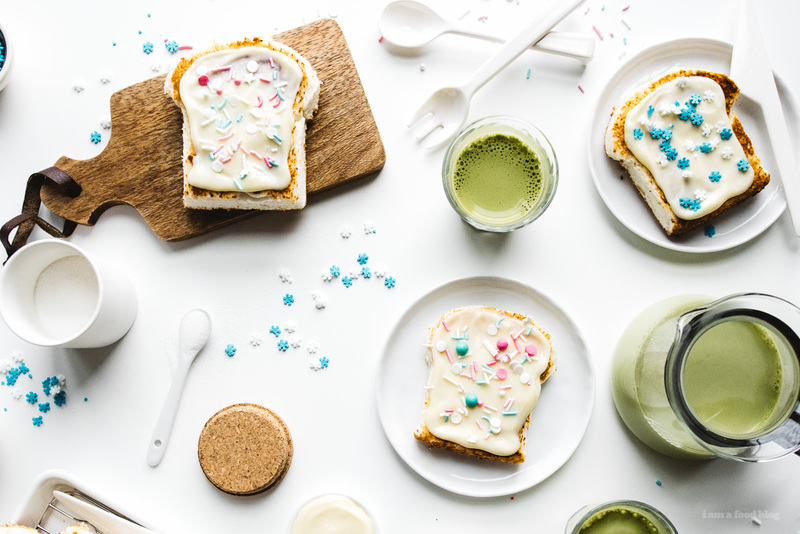 PPS – Shoutout to Lyndsay for the perfect palette of sprinkles! Sift together flour and set aside. 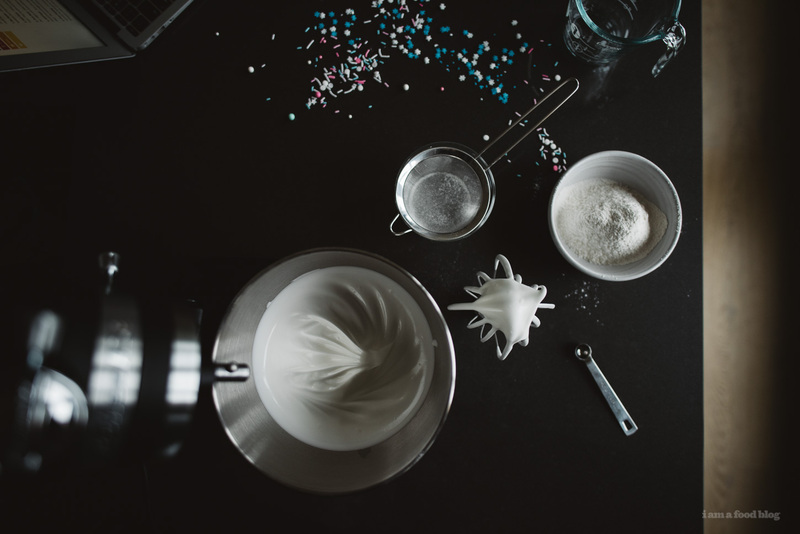 In a grease-free stand mixer bowl, add the egg whites and whip on low until foamy, about 1-2 minutes. While the eggs are whipping, whisk the sugar, cream of tartar, and salt together in a small bowl. Raise the speed to medium and add the sugar mix slowly in a small stream, whipping until the eggs reach medium peaks, 8-10 minutes. 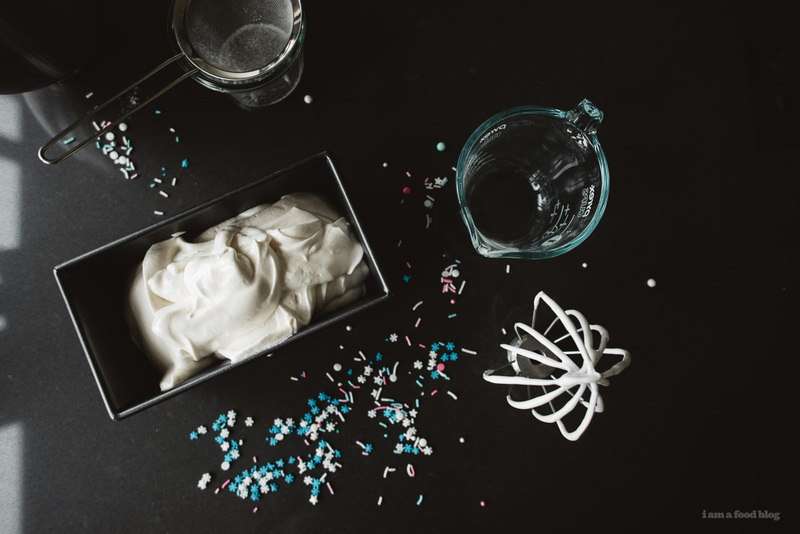 Do not over whip, the whites should be smooth and soft, not dry and clumpy. Beat in the vanilla and almond until just combined. Add a 1/3 of the flour and fold to combine. You can be slightly vigorous with this step as you’re tempering the egg whites. Add the remaining flour in 2 additions, gently folding in, leaving no streaks. Pour into an un-greased loaf pan and smooth out the top with an offset spatula. Bake 30-35 minutes. The top should be brown and cracked, and spring back when you gently press down. Cool in the pan, inverted on two cans set on the edge of the pan. Remove and slice, toasting for an extra bit of crunch! 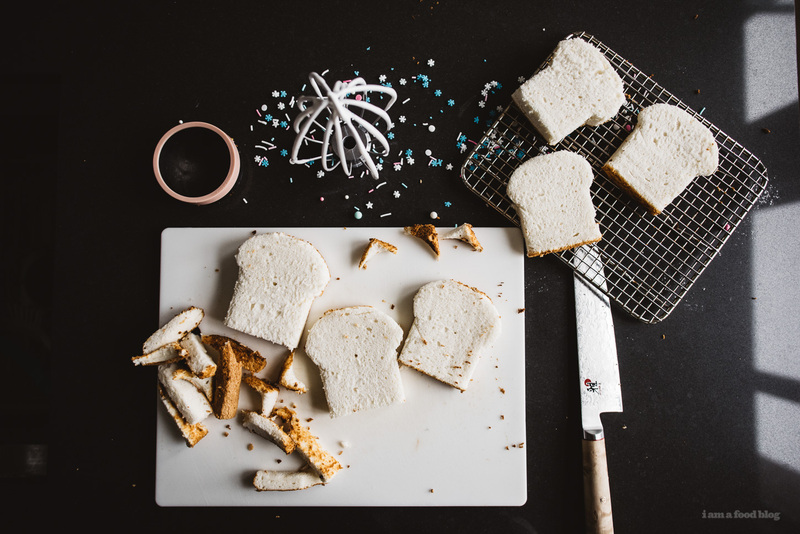 I topped mine with some whipped white chocolate and sprinkles for a bit of extra oomph, but toasted angel food cake on its own is divine as well! awwww i wish we were all eating cake toast and decorating gingerbread together too!!!!! one day :) that is the cutest angel food story but COME ON MIKE GET IT TOGETHER. sending hugs to tokyo bb!!!! lol i haven’t tried toasting cake in an actual toaster yet (i’m a fan of toast in a pan), but i think i just might have to!!! ahahahaha oh mike. “um, yeaaaaah, it was super cute… ” he totally doesn’t remember. but i’ll forever remember that cute story and your cute angel food cake toasts!!! wish we were all hanging right now singing christmas songs, with everyone out of tune except for you cause you’ve got a killer good voice. hehehe. so many hugs and cake toast cheers from la!! oh and those sprinkles are so on point. of course they’re from lyndsay!! we need a sprinkle party next!!! 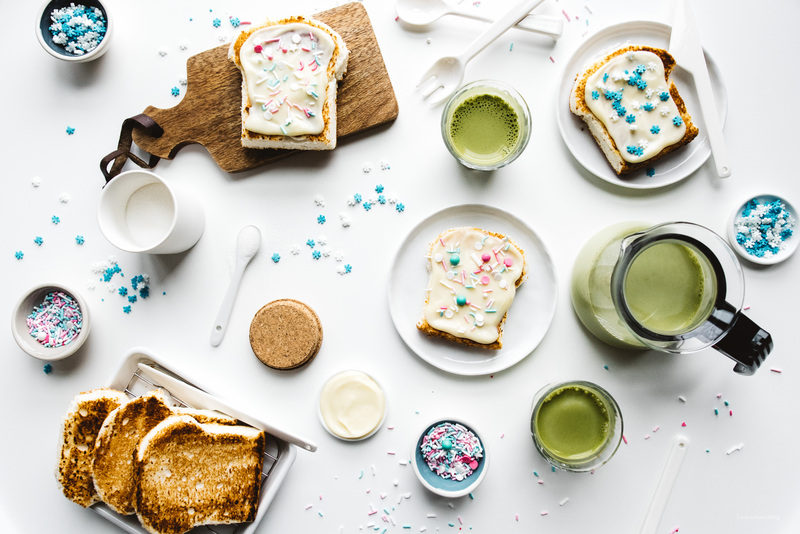 Cake toast is already a brilliant idea, but angel food cake toast takes the… is it too cheesy to say cake? Anyway, this looks bomb. THESE PHOTOS ARE SO STUNNING! Eep. I want to dive into them. And what the heck that story about you and Mike is one thousand percent too cute. Also lol to Mike’s comment below about you breaking into his locker. I guess that’s another way to look at it LOLLLLLL. 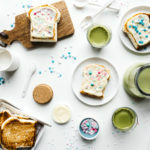 Yay for cake toast love! lololololol. um, he gave me his locker combo and clearly forgot, like how he forgot about the cake!